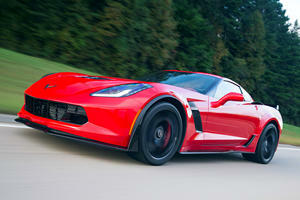 The Grand Sport fills the gap between the base model Corvette and the full-on sports car that is the Z06. Thankfully, Chevrolet have been careful about how this was executed, and the GS isn’t some stripped-down Z06, but rather a base model in which a hundred little things have been made a bit better. It’s a method that has been employed with other in-between models, and it works. It works because it makes the GS feel special. The GS is doing a lot to rid the Corvette of the stigma that comes with a lack of exclusivity. In the ladder of high performance Chevrolets, Corvette’s in particular, the Corvette Grand Sport occupies the middle-ground between the Stingray and the Z06. The Grand Sport once again revives the nameplate first seen on a ‘Vette back in 1963, but for 2018 it blends usable power with a high performance chassis that borrows from the more powerful Z06. In fact, it’s every bit a Z06 in every way but one – down on power from the top rung sports car, the Grand Sport sports the engine of the Stingray beneath its hood. But perhaps the middle ground may well be the best Corvette of all. Slip into the low-slung Corvette’s driver’s seat – 8-way power adjustable GT bucket seats are standard, but Competition Sport buckets are available – and you’ll be greeted by a cabin that’s high quality and driver-focused. In the mold of many a great sports car, the center console is angled towards the driver, housing dual-zone climate controls and Chevrolet’s MyLink infotainment system with its 8-inch touch screen and full Android Auto and Apple CarPlay functionality. Forward visibility is decent, though the rearward view is impaired – something easily remedied by the standard rear-view camera. On some trim lines, curb view cameras are also available. Available on 2- and 3LT trim limes is a revised for 2018 heads-up display. The dash and seats offer a range of claddings and upholstery in varying colors and contrast stitching. Though most materials feel high in quality, certain trim elements feel cheaper than they should at this price point. Standard on the Corvette Grand Sport, Chevrolet’s Magnetic Selective Ride Control and Performance Traction Management features a drive mode selector and magnetorheological damping. ‘Tour’ mode serves up a supple ride on a golden platter – soaking up bumps and imperfections brilliantly in spite of the standard 19- and 20-inch front and rear wheels. Those wheels come shod with standard Michelin Pilot Super Sport performance tires with exceptional levels of grip. The rear electronic Limited Slip Differential disperses torque between the rear wheels for improved handling that far exceeds the available power on offer. Even in this standard trim, the chassis is exploitable and punches way above its weight, but opt for the Z07 Performance Package and the carbon ceramic Brembo brakes, Z07 specific suspension, and Michelin Cup 2 tires add another layer of performance to an already exceptionally sharp driving tool. Though the Grand Sport boasts the chassis upgrades of the Corvette Z06, the engine is the same LT1 V8 from the Stingray, with cylinder de-activation to improve economy. 6.2-liters in displacement, power and torque outputs are the same 460 horsepower and 465 lb-ft of torque – all sent to the rear wheels by either a 7-speed manual or available 8-speed automatic gearbox. 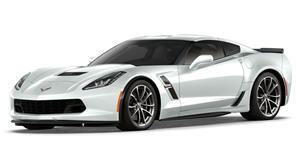 While enough for the Stingray, those outputs feel meek and mild in the Grand Sport’s chassis. 0-60mph arrives in a claimed 3.6 seconds, while the sports exhaust – standard on the Grand Sport – ensures a suitably sonorous soundtrack to the driving experience. The Corvette Grand Sport is available in 3 trim lines – 1Lt, 2Lt, and 3LT – entry level equipment includes a 9-speaker Bose audio system, dual-zone climate, cruise control, and power tilt and telescopic steering. 2LT trim adds curb view cameras, a heads-up display, power lumbar support, and heated and ventilated seats. 3LT trim includes suede microfiber trim, and the (optional on other trims) performance data logger and video recorder. Safety features include a rear-view camera, electronic traction control, and stability control. 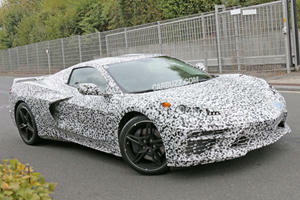 The Corvette has not been crash tested by any local authorities. Some may feel that the Corvette Z06 has just too much power to handle – the Corvette Grand Sport remedies that by removing some of the power. The only real flaw is that with the Stingray’s engine, the chassis begs for more power – at least enough to split the difference between the top and bottom rung ‘Vettes. 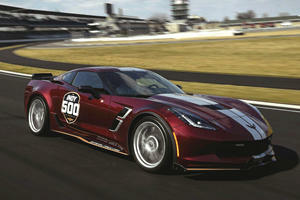 Chevy's sports car to pace the race for the 16th time.